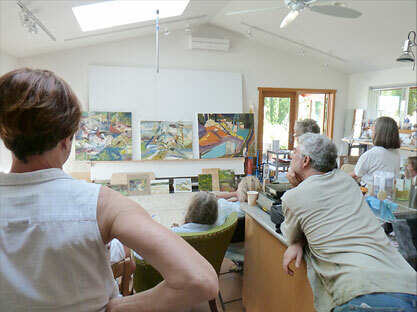 Kathy Gore Fuss designed and built her studio in 2008 – 2010. Landscaping followed in 2011, and the studio was officially up and running that August. Gore Fuss has extensive teaching experience ranging from college level courses to artist-in-residencies through the WA State Arts Commission. As a dedicated artist and teacher, she is committed to offering sophisticated workshops and classes to the South Sound Area. Gherard’s work explores the idea that painting and drawing have the ability to present inanimate objects in ways that allow the viewer to empathize with them. She received her BFA from the Rhode Island School of Design (2002) and her MFA from the University of Washington (2004). Emily was represented by Francine Seders Gallery and Blindfold Gallery. Her work has been featured in shows at Seattle City Hall, Cornish College of the Arts, 4Culture in Seattle, Henry Art Gallery, and University of Arkansas. Emily has received PONCHO Special Recognition Award (2006) and a GAP Grant (2014). She has taught for the last 10 years throughout the Puget Sound area, including North Seattle College, Everett Community College, Bellevue College, and Western Washington University. Oil paint is a versatile and malleable medium. Expand your use of this traditional material and develop a personalized process for your unique studio practice. Students will learn how to make oil paints from scratch, experiment with different techniques and develop their own personal use of color. Build a three dimensional construction with your own choice of materials. Draw, paint and/or collage your way into exploring the modes of abstraction through observational painting. Enjoy a supportive learning environment with individualized instruction. The lectures are also open to the public, $10 per evening or $25 for three. Free for workshop participants. Lectures will be held at Susan Christian’s Salon Refu Project Space in Olympia.